A quality speaker can make a huge difference to your home audio system. An upgrade to your current speaker could transform your cinematic experience and help you immerse in the film completely. However, finding a speaker that compliments your home theatre system may prove to be somewhat difficult. Regrettably, many people don’t even bother to go through a research. But you had better not follow their suit, otherwise, you could end up with a below average speaker and an endless regret. Not an attractive prospect, right? That’s why it’s important for you to know all you can about your prospective speakers. This leads me to write a detailed review of poll’s smart new tower T50, which might bring an end to your search for a quality speaker. Over the years, the Polk has acquired a reputation for making high-quality speakers at a budget price. In line with their tradition, they have unveiled their new floor-standing tower speaker T50, which despite encompassing all the qualities of a high-end speaker, comes at a low price. The tower speaker boasts a silk-dome tweeter alongside a 6.25-inch extended throw composite driver. And, what’s more, it includes two front firing sub-bass radiators for better bass. All of these have been engineered with Dynamic Balance Technology, which is the sole property of Polk. In addition, the floor standing speaker has a sensitivity rate of 90 dB and its peak power is rated at 150 watts. Moreover, it has a frequency rate of 38 Hz-24 kHz. Thanks to its wood vinyl finish, the 36.2 inches speaker looks snazzy and will compliment any home decor. The Polk speaker offers a very attractive look and has MDF cabinet, which is coated with a beautiful wood vinyl finish. It also comes with a demountable grille for the protection of the drivers. The T50 speaker is quite large measuring 7.75″ wide by 36.25″ high and 8.75″ deep. The bottom two drivers are passive radiators, which means they have no wire connected to them and are designed to augment the woofers. The radiators will provide better bass quality as it amplifies bass energy in a similar way to a port but minus the chuffing noise. The T50 speaker has an impedance rating of 6 ohms impedance. Notwithstanding the fact that 8 ohms would have been perfect, 6 ohms is in no way terrible and should be sufficient. If you are clueless about impedance, then know that impedance is the resistance your speaker offers to the electric signal your amp is sending to them. Impedance is crucially important for your amplifier, as it needs to see some resistance to the power it sends; else it might get burned out by pumping out power continuously. A 1″ silk dome twitter has been used in the speaker to ensure wide dispersion pattern, which means a larger ‘sweet spot’ for you to work with. In addition, the silk-the material used in the tweeter- tends to sound warm and gentle, and has been designed for high power handling. Besides, it adds additional stiffness and increased dampness to the twitter, which allows it to pump out the volume without losing the accuracy. The speaker has a sensitivity rating of 90 dB. But, is sensitivity rating important?? Well, the sensitivity rating of your speaker tells you how loud your speaker plays per watts. A speaker with a low sensitivity rating would need much more power to reach the high volumes. In short, the higher sensitivity rating a speaker has the better. Anything above 88 dB is a good sensitivity rating. A cabinet is a major and important component of a floor standing speaker. The furniture-grade MDF cabinet, which is well constructed and sturdy, reduces distortion and resonance so that you could hear your favourite song without any disruption. On top of that, the vinyl wood finish and its gorgeous look will make sure that it takes away none of the beauty of your home décor. Frequency Rate: 38 Hz-24 kHz. 1. If this speaker can hit 38 Hz, do I still need to buy a subwoofer? It isn’t a must, but to get full bottom end sound, a subwoofer is required. 2. Can 8 ohms run this 6-ohms speaker without any problem? Well it depends. You need to check your amplifier, if it says 4-8 ohms, then you needn’t worry. 3. Is it true that the lower two drivers are not connected by any wires? Answer: Don’t mistake them for subwoofers. The last two drivers are bass radiators, and it’s true that they are not connected by any wires. 4. Can it be mounted on the wall? No, you can’t. For it is a floor standing speaker. 5. I intend to use it for music, so what type of stereo would go with this speaker? Any good quality stereo would do, but make sure that whichever stereo you buy is capable of driving it. 6. Would you recommend this speaker for sound when we are enjoying a movie outside? Despite being designed for indoor use, it would certainly work outside. However, it would be better to use a subwoofer. 7. Where should it be used for best music central, rear or front? It could be used in either front or rear, but not suitable for the centre channel. 8. What about Base, Height and width? 9. Question: Is it three way Speakers? 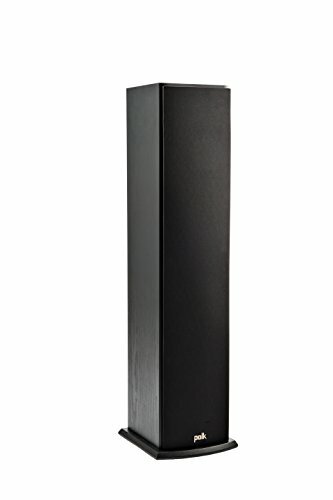 Although I won’t call Polk T50 a paradigm for tower speakers, it certainly offers great value for money. No doubt, it has deficiencies, but its lackings are only visible when compared with other more expensive speakers. Therefore, if you’re looking for a speaker which will improve your home audio system without breaking the bank, then you could give the T50 speaker a chance.